Life In Progress was performed three times at Chekhov International Theatre Festival in Moscow this week. The show was on at the Moscow State Academic Mossovet Theatre with a packed audience each night consisting of just under nine hundred people. The captivated audience broke out into a wild applause at the end, which was too much for some with one overzealous audience member running on stage, planting a kiss on Sylvie before disappearing into the night! 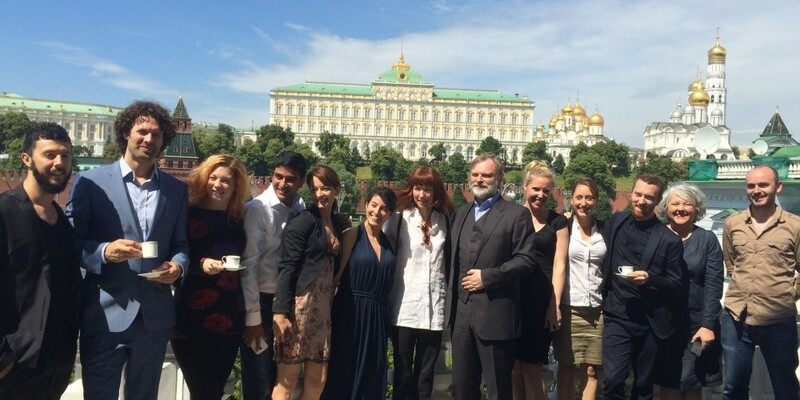 Above is the team: dancers, musicians, technicians, and producers having a spot of lunch with the UK ambassador in Russia at the Kremlin. 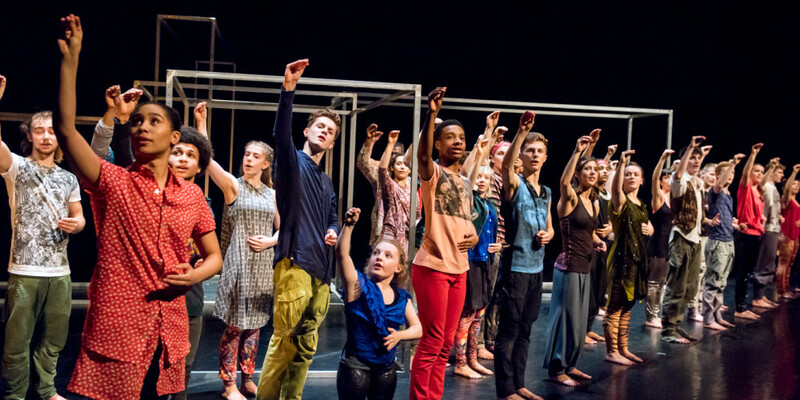 Sadler’s Wells’ National Youth Dance Company, under the direction of Guest Artistic Director Sidi Larbi Cherkaoui will begin their national UK tour this weekend. Their first stop is mac in Birmingham. The show, Frame[d] is comprised of moments from Cherkaoui’s established catalogue of work including Babel(words) co-choreographed with Damien Jalet, Puz/zle, and Tezuka. However, Frame[d] also incorporates the young dancers’ new ideas and fresh material as well as featuring Antony Gormley’s fabulous steel box sculptures. Also at mac this Saturday will be an extra Experience Workshop. So if you’re lucky enough to be in Birmingham this weekend definitely don’t miss out on this great opportunity to find out more about the company. 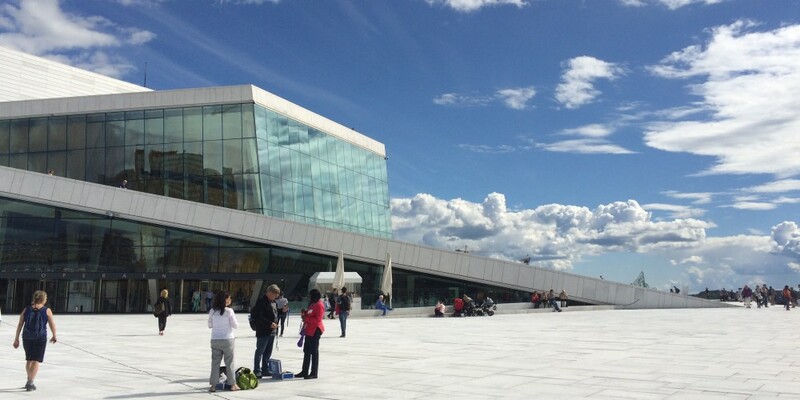 This week Life In Progress was in Athens as part of the Athens and Epidaurus Festival 2015. 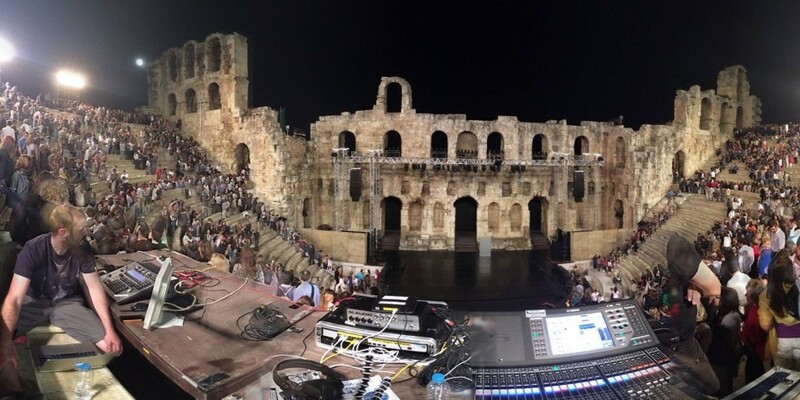 Situated right next to the Acropolis in the Odeon of Herodes Atticus, an outdoor amphitheatre pictured above, it was hard to imagine a more picturesque spot for the Greek goodbye (or αντίo) to Sylvie. Over nine thousand people were enchanted by the spell binding show causing an atmosphere so electric it rivalled Zeus’ own lightning bolt. This picture was taken by Nick Rundall the shows sound engineer and the production manager Andy Downie is in the left corner preparing everything for a perfect performance.